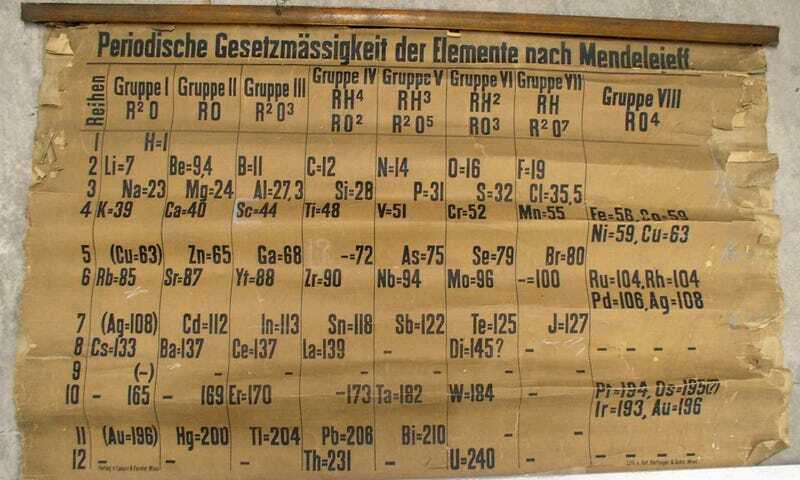 The chart of elements dating back to 1885. [The] St. Andrews table was clearly an early specimen. The table is annotated in German, and an inscription at the bottom left – ‘Verlag v. Lenoir & Forster, Wien’­ – identifies a scientific printer who operated in Vienna between 1875 and 1888. Another inscription – ‘Lith. von Ant. Hartinger & Sohn, Wien’ – identifies the chart’s lithographer, who died in 1890. Working with the University’s Special Collections team, the University [of St. Andrews] sought advice from a series of international experts. Following further investigations, no earlier lecture chart of the table appears to exist. Professor Eric Scerri, an expert on the history of the periodic table based at the University of California, Los Angeles, dated the table to between 1879 and 1886 based on the represented elements. For example, both gallium and scandium, discovered in 1875 and 1879 respectively, are present, while germanium, discovered in 1886, is not. As a final step, the restorers created a full-size replica of the chart, which is now on display at St. Andrews. As for the original, it’s now resting safely at a climate-controlled room at the Special Collections facility. Hopefully it won’t be forgotten for another century.